Shocking new pictures have surfaced of millionaire Charles Saatchi supposedly choking his wife, celebrity chef Nigella Lawson, at a swanky London restaurant. The Mirror’s Sunday People published the photos, believed to have been snapped at Saatchi’s 70th birthday dinner at Scott’s in the Mayfair district on June 9. In one image the man’s hands are clenching her neck, in another he appears to be grabbing for her nose. Check out the video to see the pics. An eyewitness told The Mirror, "It was utterly shocking to watch. I have no doubt she was scared. It was horrific, really. She was very tearful and was constantly dabbing her eyes." The two reportedly left the restaurant separately. "About a week ago, we were sitting outside a restaurant having an intense debate about the children, and I held Nigella's neck repeatedly while attempting to emphasize my point," he said. "There was no grip, it was a playful tiff." A Scotland Yard spokesman told ABC that officers are looking "to establish the facts in order to assess whether an investigation is necessary." 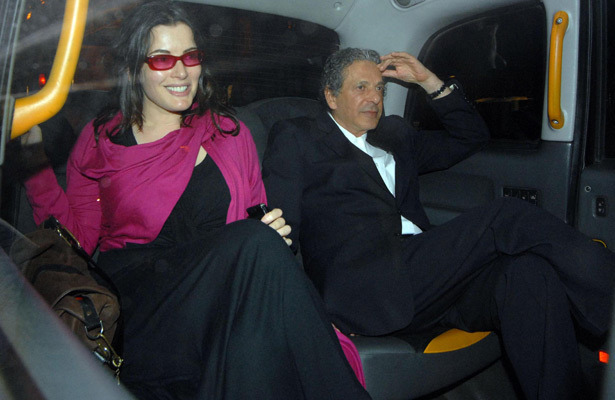 Nigella has a son and daughter from her marriage to late journalist John Diamond, who died of cancer in 2001. Saatchi has one daughter from a previous marriage.